A unique building can be seen from this autumn on the Národní třída, one of the streets in Prague that is most loaded with historical memories. A place where Soviet tanks passed through during the occupation of Czechoslovakia in August 1968 and where the student demonstration was put down with brutal police force in November 1989 (which triggered the Velvet revolution and the end of the communist regime). Yet a corner remained unbuilt for decades. Large graffiti on the surrounding walls by the artist Blu recalled these historical events with the motif of tanks moving in an endless loop. For years, it used to be one of the most expensive plots in the city. Several development projects, including a luxurious hotel, have failed here. It was not until this year, that a modern city palace, with offices, shops and restaurants, was completed on the site. 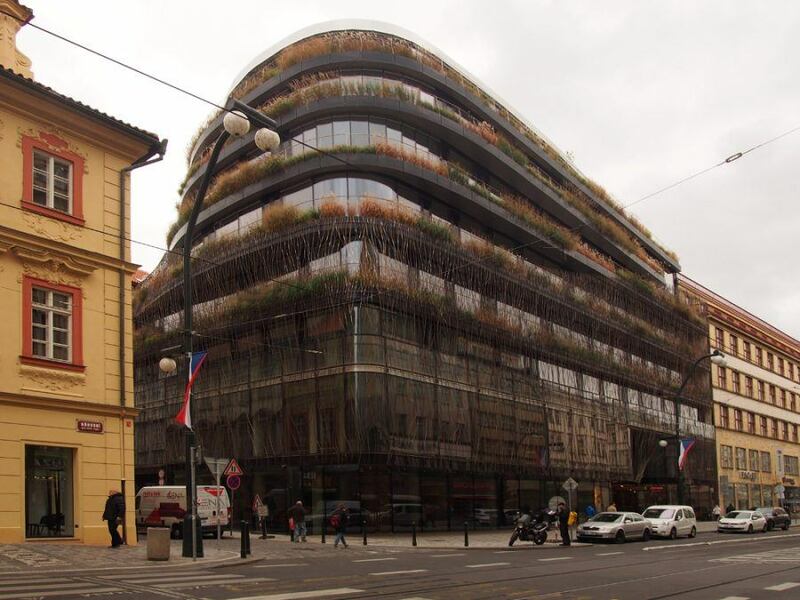 Prague architect Stanislav Fiala decided to create on the narrow plot a light glass house with rounded corners, which literally grows with various plant motifs. In front of the glass facade there are ledges with a variety of living plants, ranging from bamboo to tulips, which are changed over the course of the year. Complimenting the cloud of climbing plants, subtle ornamental grilles climb the outside of the glass. The roof of the building wears a garden crown with tall trees. The multi-purpose building, called “the Turf“, also merges with a neighbouring 18th century Rococo palace. New pedestrian passageways link the patio of the house with the busy street. The architect designed the interiors down to every last detail, including cast concrete reliefs in the lobby, door handles and entrance pulls made by reinforcement steel rods. “The Turf“ can be seen during the “The Modern City” tour, focusing on modern architecture in the historical context. 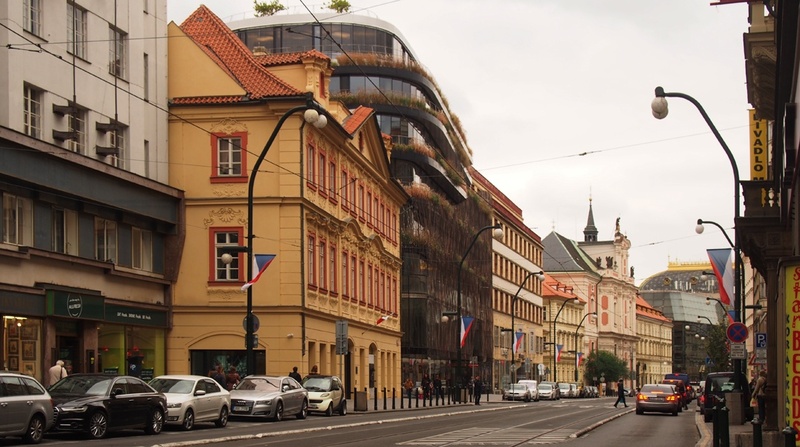 The route connects the central Wenceslas Square with the Vltava river embankment and presents not only many of Prague’s beautiful Art Nouveau and modernist houses, but also it’s contemporary buildings in their urban surroundings. 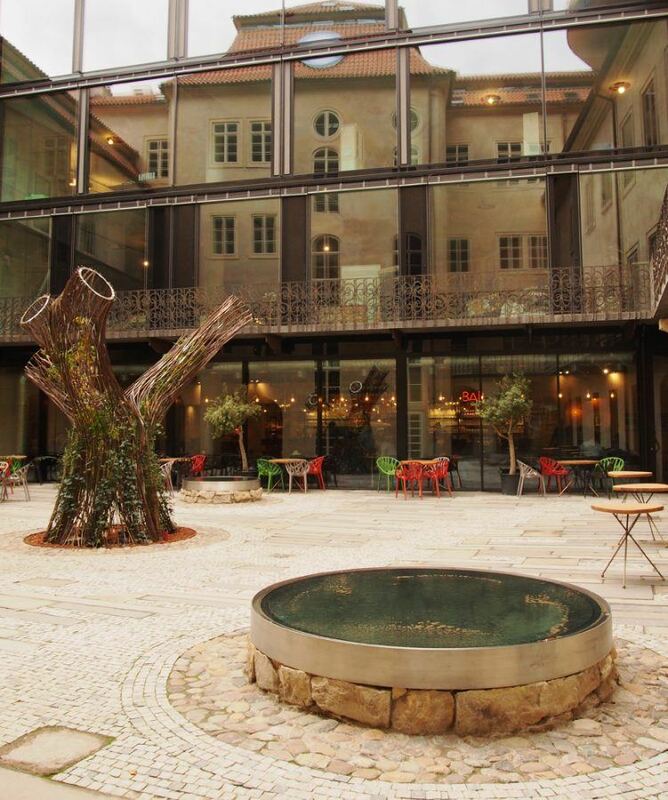 Nearby, there are also stylish cafés and restaurants that can be visited after the walk.